Received December 12, 2018; Revised January 14, 2019; Accepted January 28, 2019. The use of retrievable inferior vena cava (IVC) filters has markedly increased in the recent years. However, the failure rate for the retrieval of the IVC filters using the endovascular method is reported to be up to 19%. Open surgical removal of the IVC filters is technically challenging and may require longitudinal cavotomy, clamping, and repair of the IVC. Here, we present a case of successful open surgical removal of the IVC filter using minimal cavotomy. This technique is an effective method after a failed endovascular removal attempt. A retrievable inferior vena cava (IVC) filter was widely available after its introduction in clinical practice, and its use has markedly increased ever since. The retrievable IVC filter is a suitable option to provide temporary protection against pulmonary embolism (PE). However, the IVC filter should be removed as soon as the patients are not at high risk of developing PE. The failure rate for the retrieval of the IVC filters using the endovascular method is reported to be up to 19% . Retaining an IVC filter in a patient for long can lead to significant complications, including IVC penetration, erosion into the adjacent organs, filter migration, and caval thrombosis . In general, open surgical removal of the IVC filter is technically challenging and may require longitudinal cavotomy, clamping, and repair. In this report, we present a case of a successful open surgical removal of an IVC filter using a minimal cavotomy. 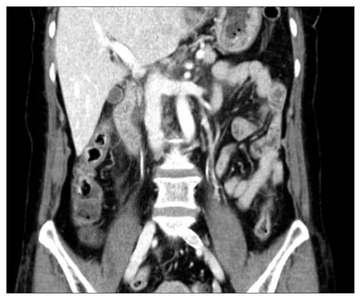 A 61-year-old woman was admitted to Wonkwang University Hospital with chest discomfort and intermittent abdominal pain. She had a history of deep vein thrombosis (DVT) involving the left common iliac, external iliac, and common femoral veins. Approximately 7 years ago, a Celect filter (Cook Medical Inc., Bloomington, IN, USA) was placed after detecting a massive PE on the initial computed tomography (CT) venography. Six months later, the filter was still in place because of a large thrombus that remained even after performing a catheter-directed thrombolysis to dissolve the thrombus. CT venography showed that the hook of the Celect filter had dislodged and entered into the left renal vein, whereas the filter prongs had penetrated the IVC wall (Fig. 1A). Moreover, one of the filter prongs appeared to have protruded out of the IVC wall and into the duodenum (Fig. 1B). Since an attempt at using an endovascular approach to remove the filter was ineffective, we opted to use the open surgical approach. Surgical exposure was performed through an incision across the midline of the abdomen. 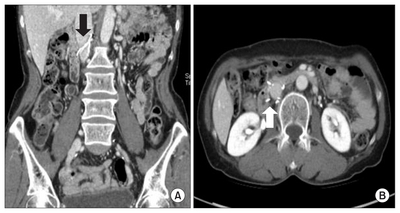 Hepatic flexure of the colon was mobilized, and the duodenal Kocher maneuver was performed to expose the IVC (Fig. 2A). The filter prong protruding into the duodenum was dissected out at the outer wall of the IVC with a wire cutter (Fig. 2B). The duodenum was then sutured back using seromuscular sutures (Fig. 2C). All other protruding prongs were then removed by cutting them off close to the IVC wall (Fig. 2D). The IVC and left renal vein were dissected and encircled with vessel loops and umbilical tapes to prevent excessive blood loss during surgery. The filter hook was easily identified in the left renal vein, and a 4-0 polypropylene purse-string suture was placed around the filter hook (Fig. 2E). A small cavotomy (approximately 0.5 cm in length), suitable enough for the filter hook to pass through, was made in the middle of the purse-string suture. The filter hook was then grasped with a mosquito clamp, and an attempt was made to remove the IVC filter using the snare retrieval kit, but we failed. Therefore, the IVC filter was slowly removed using the mosquito clamp (Fig. 2F). After removing the filter, the purse-string suture was tied (Fig. 2G). Clamping of the IVC was not required. The patient’s vital signs were stable during the surgery, and perioperative transfusion was not required. Postoperative CT venography showed a good result, with no IVC stenosis (Fig. 3). The patient was discharged on postoperative day 5. Postoperatively, oral anticoagulants (rivaroxaban) were maintained for 3 months, and the patient was well without any symptoms at the 6-month follow-up. Venous thromboembolism, including DVT and PE, is a common and potentially life-threatening condition. Indications for the IVC filters have traditionally included the presence of a contraindication to therapeutic anticoagulation, anticoagulation complication, and progression of DVT despite adequate anticoagulation. Moreover, other indications for the IVC filters, such as massive clot burden or reduced cardiopulmonary reserve prior to thrombolysis of the iliocaval DVT or prophylaxis in high-risk patients, have greatly expanded in the recent years . Retrievable IVC filters were first approved by the US Food and Drug Administration in 2003. Due to the simplicity of placement and advancements in the retrievable technique, the use of the IVC filters increased in the recent years. Although most IVC filters can be removed using standard endovascular snare techniques, many are left in place for extended periods of time. This can lead to significant complications, such as IVC penetration, erosion into adjacent organs, filter migration, and caval thrombosis . Several advanced retrieval techniques, such as various loop-snare techniques, rigid endobronchial forceps, and angioplasty balloon techniques, have been described to remove the filters after failed attempts using standard endovascular snare techniques. However, after failed attempts using endovascular procedures, open surgical removal is not recommended for asymptomatic patients. In our experience, open surgical removal is generally reserved for patients experiencing complications due to the implanted IVC filters. Moreover, the classic surgical removal of IVC filters usually requires longitudinal cavotomy, clamping, and repair of the IVC. In contrast, the method used in this case has advantages, such as elimination of the need for IVC clamping or longitudinal cavotomy and minimal operation time. This method was suggested in several case reports and small series reports. For example, Connolly et al. described the open surgical IVC retrieval technique using a small cavotomy with purse-string suture and a 9-F endovascular sheath. Moreover, Reed et al. described a successful technique to remove retrievable IVC filters using a small stab wound with purse-string suture and a Rommel rubber tourniquet. Although slight differences were observed between these IVC filter removal techniques, in both methods, the purse-string suture with small cavotomy is used, and filter removal is possible without IVC clamping. However, there are some limitations of this technique. For example, the procedure cannot be completed if the filter’s hook is embedded in the IVC posterior wall . In these cases, classical surgical removal may be a better option. In conclusion, open surgical removal of the IVC filters using minimal cavotomy can be an effective method after a failed endovascular removal attempt. Fig. 1. Preoperative computed tomography venography. (A) The filter hook is dislodged into the left renal vein and the filter prongs perforate the inferior vena cava wall (arrow). (B) One of the protruding filter prongs appears to be penetrating into the duodenum (arrow). Fig. 2. Surgical technique (A) inferior vena cava (IVC) exposure. (B) Dissecting the filter prong protruding into the duodenum. (C) The duodenum is primarily repaired with seromuscular sutures. (D) All other protruding prongs are dissected and cut close to the IVC wall. (E) A 4-0 polypropylene purse-string suture is placed around the filter hook. (F) The IVC filter is removed step-by-step using a mosquito clamp. (G) After removing the filter, the purse-string suture is tied. (H) Image of the removed IVC filter. Fig. 3. Postoperative computed tomography (CT) venography. Postoperative CT venography image showing the patent inferior vena cava without stenosis. Uberoi R, Tapping CR, Chalmers N, Allgar V. British Society of Interventional Radiology (BSIR) Inferior Vena Cava (IVC) filter registry. Cardiovasc Intervent Radiol 2013;36:1548-1561. Lee JK, So YH, Choi YH, Park SS, Heo EY, Kim DK, et al. Clinical course and predictive factors for complication of inferior vena cava filters. Thromb Res 2014;133:538-543. Stein PD, Kayali F, Olson RE. Twenty-one-year trends in the use of inferior vena cava filters. Arch Intern Med 2004;164:1541-1545. Connolly PH, Balachandran VP, Trost D, Bush HL Jr. Open surgical inferior vena cava filter retrieval for caval perforation and a novel technique for minimal cavotomy filter extraction. J Vasc Surg 2012;56:256-259 discussion 259..
Reed NR, Gloviczki P, Stockland AH, McBane RD. Open surgical removal of a tilted and dislodged inferior vena cava filter through a lumbar branch without cavotomy. J Vasc Surg Venous Lymphat Disord 2013;1:304-308.